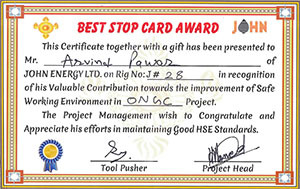 HSE Excellence & Incentive Programmes » QHSE Policies » John Energy Ltd.
John Energy Ltd has implemented the Hazid Observation programme to inculcate the collective responsibility of the crew to identify the existing and generating hazards of unsafe Acts and Unsafe conditions in our day to day activities. All crew and visitors and service companies participate in the programme to ensure that safe work environment is established with everyone’s collective effort. Weekly evaluation of the observations are made by a team of Installation incharge and HSE officer to recognize the crew member with token gift for his alertness to eradicate or correct the unsafe condition or act. The Best Rig of the quarter award has been instituted for each category of the Rigs in Operation namely 50Ton and below, below 1150 Ton, Below 250 ton and above 250 ton category. The Rig performance criteria is based on its Operational Performance in Drilling or Work over services, Inter-location movement performance, and HSE Performance based on leading and Lagging parameters. 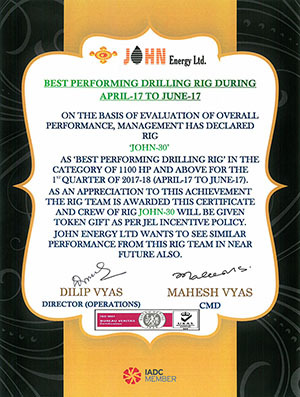 The Best Rig is recognized with a certificate and token gift to all John and Subcontractor crew and operator representative. The 5S Programme has been instituted and implemented to inculcate the orderliness in the permanent locations like Offices, warehouse and workshops, to save productive time. 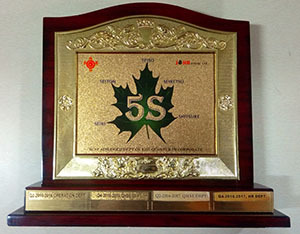 The 5S audit is conducted every quarter for all the permanent locations and adjudged department team is recognized with Plaque and certificate.